Our Cyber Monday Discounts are valid for reservations made between November 27th and December 20th, 2017 for stays next year. Reserve your 2018 stay in Italy with Italy Perfect for the best prices of the year! Be sure to mention Cyber Monday when you contact us to reserve. Please see the full offer on this page. Valid on new reservations only. 2 Bedrooms, Sleeps 4 + 1. Sunny quiet and fully equipped with washer, dryer, wifi. Convenient to Piazza del Popolo, minutes from the Spanish Steps, you will find every amenity in this spacious apartment. Modern conveniences include air conditioning, Satellite TV, wireless internet access, stereo and microwave. This large apartment features the combination of comfort and location. All your needs have been considered in the amenities offered. 3 Bedrooms, Sleeps 5. Elegant and desirable Spanish Steps luxury. 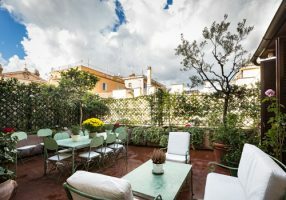 Elegance and luxury near the Spanish Steps in Rome describe this lovely apartment with three bedrooms and an expansive terrace. 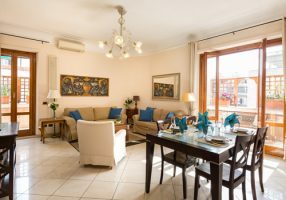 This is the Rome of your dreams: a gorgeous apartment in the most upscale, centrally located neighborhood in the historic center of Rome. It is comparable to a five star hotel but more spacious and private. 2 Bedrooms, Sleeps 4. 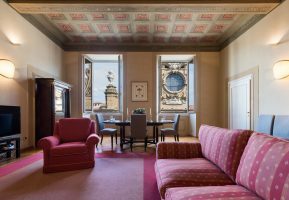 This elegant apartment can be a highlight of your stay in the center of Florence. It reflects the wonderful architecture of the only baroque church in Florence. High and bright, it has a comfortable living room area and good sized bedrooms suites. 3 Bedrooms, Sleeps 6. The Medici apartment is made for a dynasty with space for everyone to come together. 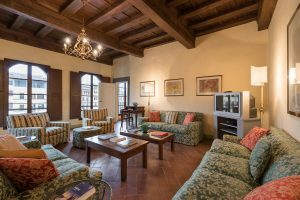 This historic palazzo in Piazza Santa Croce contains totally up-to-date apartments in central Florence, Italy. Not only are the furnishings luxurious, the views over the piazza to the handsome medieval church are breathtaking. Each apartment features its own historic atmosphere with Renaissance murals, family heirloom antiques, and talented decorating. Many guests spend the season here, returning year after year. Enjoy our many fine properties at ItalyPerfect, ParisPerfect and LondonPerfect.